CBS News reports that South Florida pedestrians are more likely to be involved in hit-and-run accidents than pedestrians anywhere else in the nation. According to a recent report, part of the blame rests on dangerous road design that makes it more difficult for pedestrians to safely cross the streets. The problem is only growing worse, and many Floridians are calling on city officials to redesign roads. According to Smart Growth America, 5,189 pedestrians died in car accidents during the nine years between 2003 and 2012. Pedestrians in Florida also account for more of the overall traffic deaths than the national average. The National Highway Traffic Safety Administration reports that pedestrians make up 14 percent of traffic deaths in the country, whereas Florida’s pedestrians represent 17.7 percent of fatalities. Just as news broke of the study, another Florida pedestrian accident reminds us all what’s at stake. TheMiami Herald reports that a driver was speeding when he ran a red light and struck a crossing guard and two young girls who were crossing the street. The 70-year-old crossing guard died at the scene, and paramedics found the girls with fractures and possible head injuries. The driver immediately exited his vehicle and ran away from the accident. Police quickly caught up with the man and say that charges are pending. There is no word on whether or not drugs or alcohol were involved in the accident. WFTV News investigated the troubling trend of hit-and-run accidents, and learned that most drivers who flee the scene are intoxicated. If they can escape long enough to sober up, they may face a few months in jail as opposed to years if charged with drunk driving. At least one Florida family is taking matters into their own hands. When investigators couldn’t file charges against a driver that killed a young girl and fled the scene, her parents decided to file a civil case to find justice. The family still hopes that the driver will face criminal charges, but they say they are tired of waiting. If you’ve suffered serious injuries in an accident with a negligent driver, call us as soon as possible. At Wolfson Law Firm, LLP, we help Miami residents file civil lawsuits. 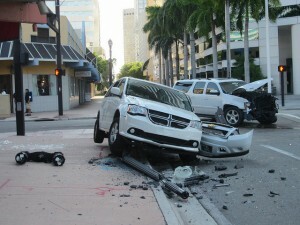 To schedule a free consultation with a Miami accident lawyer, call us today at 305-285-1115. The Sun-Sentinel reports that a bill awaiting the governor’s signature would create harsher penalties for hit-and-run drivers. The law includes a minimum jail sentence of four years for hit-and-runs that cause a death, as well as a three-year license suspension. Legislators wrote the bill in an effort to curb the growing number of these accidents after learning that Florida experienced 78,522 hit-and-runs in 2013. If you’ve been involved in an accident with a reckless driver, you’ll need an experienced accident attorney on your side to help you find the compensation you deserve. To learn more about our services or to schedule a meeting with a Miami accident lawyer from Wolfson Law Firm, LLP, call us today at 305-285-1115.